Tie your skates tightly to avoid ankle wobble. It's like a scene from a movie -- you're serenely skating around a rink holding hands with your honey. Of course, everything's perfect -- until you crash, cutting your picturesque moment short with a hurt ankle and wounded pride. Ankle sprains and strains are common ice skating injuries, thanks to ill-fitting skates and the slippery surface of the ice. 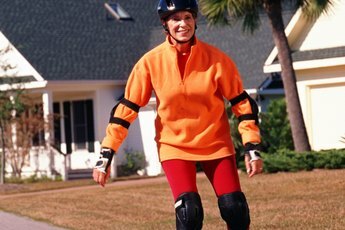 Protect your ankles from injuries when ice skating and look like a seasoned pro when making your way around the rink. Perform ankle-strengthening exercises before you head out onto the ice and as part of your regular workout routine. Strong ankles support you better, reducing the chance of a serious sprain. Loop a resistance band around your right foot. Point your toes and then flex your foot against the resistance of the band, 12 to 15 times; repeat with your other foot. Wear the right size ice skates. Skates don't fit like your favorite heels -- they should be snug through the foot and ankle for the right support. If you can slide your foot around in your skate, it's away too big and won't keep your ankle stable. If you can't wiggle your toes, the skate is too tight and can cut off circulation. Pick a size that is comfortably snug to keep you upright on the rink. If you're renting skates, keep swapping them out for another size until you get the right fit. Choose skates that have stiff boots and adequate padding. Skates that have been worn a lot may have boots with too much flexibility and worn padding. The stiffness and padding are essential for optimum ankle support. Tie your skate laces properly. Loosen your laces all the way to the bottom of the skate and then begin tightening them, row by row, until you get to the top. You want nice, even rows of laces that keep your foot snug. If you have problems with your laces getting loose as you skate, replace them with wax laces. These stay tighter because they won't loosen up when they get wet, according to hockey pro Robert Hineline on the Dallas Stars website. Skate with proper posture. Your ankles should always remain perpendicular to the ice, advises the British Columbia Podiatric Medical Association. Your ankles should never bend inward as you skate. If you're not exactly steady on your skates, hey -- it's a good excuse to get close to your guy. Wear an ankle brace if you've had past ankle injuries, you have trouble keeping your ankles steady or your ankles are generally weak. 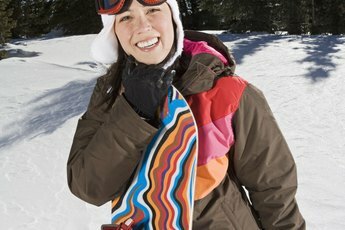 A thin brace sleeve or even ankle tape wrapped around your foot ankle can give you a little extra support in case you do crash on the ice. Just make sure that you lace your skates tightly over the brace to get the most support. See your doctor if you have a bad fall and feel a sharp pain or a tugging in your ankle. You may have sprained it and continuing to skate could do worse damage.